A few weeks ago, I did Joanne Chang’s macarons — or, as she called them in pre-macaron-craze days, “Almond Macaroons with Bittersweet Chocolate Ganache”. 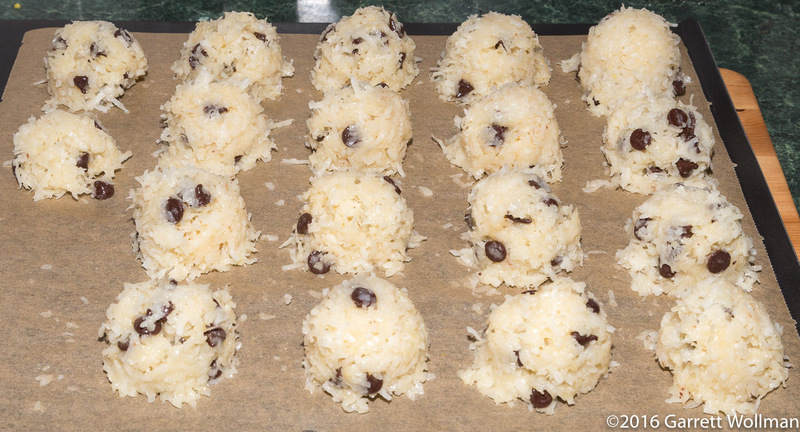 This week, I’m back with her macaroons — proper macaroons, or “Coconut Macaroons” as she calls them in her 2010 cookbook Flour (Chronicle Books; p. 122). Although my schedule for baking these was stretched out by travel and work events, everyone who tried one when I finally did bring them into the office thought they were very good examples of their type. 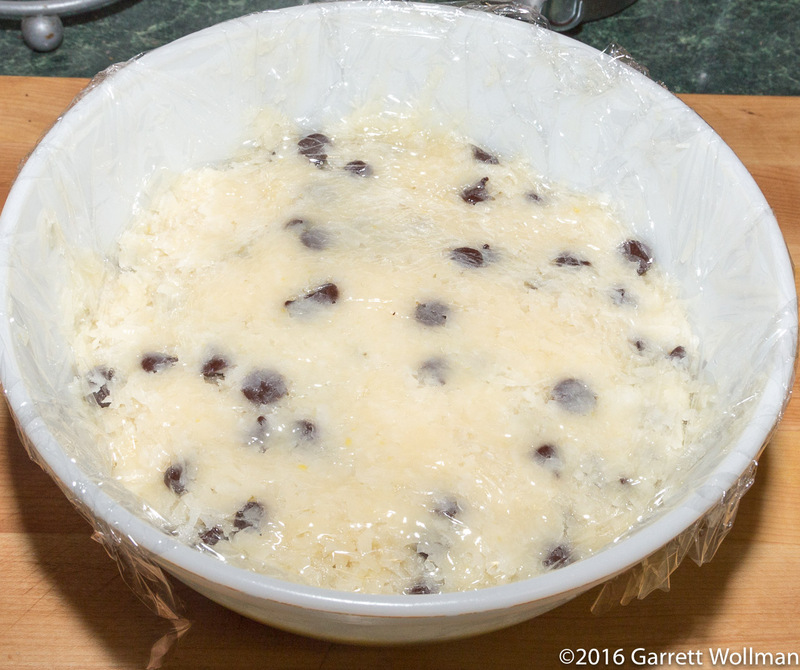 The pastry cream is made from 120 g milk (I used low-fat because I don’t drink whole milk, and you can’t buy milk in such small quantities from my preferred dairies), two egg yolks, ½ tsp of vanilla extract, and a mixture of 50 g sugar, 20 g cake flour, and a pinch of kosher salt. 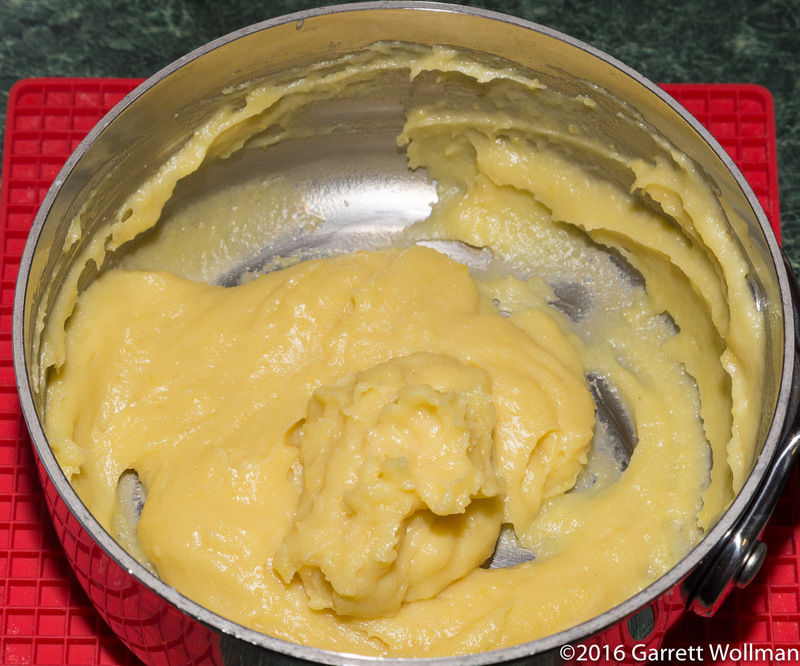 The milk is scalded in a saucepan, while the flour-sugar mixture is whisked together with the egg yolks; the resulting mixture is then tempered with the hot milk before returning the whole mass to the stove to cook until it thickens to the texture of, well, pastry cream. Now for the main event: the macaroons proper. I took the “Doe’s Chocolate Chip Macaroons” option, given in a sidebar, of adding 165 g of semisweet chocolate chips (I used Guittard 46% semisweet chocolate baking chips). The other ingredients are the same regardless: the prepared and cooled pastry cream; six egg whites (the two left over from the pastry cream plus four more I took out of the freezer); 200 g of sugar; two 14 oz (400 g) packages of Baker’s “Angel Flake” sweetened shredded coconut; and another pinch of kosher salt (not shown). It is possible that there are other brands of sweetened shredded coconut, but I wasn’t able to find any. 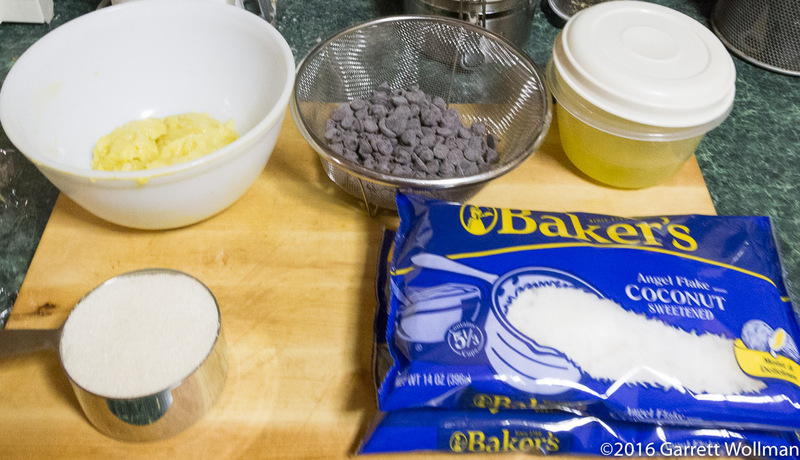 All of these ingredients are simply mixed together to make the macaroon dough. I, um, ate some of the dough before it was baked. (Why is it that raw eggs, which are generally disgusting, suddenly become edible when mixed with sufficient quantities of sugar?) But due to my travel schedule, I could not bake the macaroons immediately in any case, so I covered the bowl with plastic wrap and put the dough in the refrigerator until I got back — Chang says this dough will last for five days before baking. 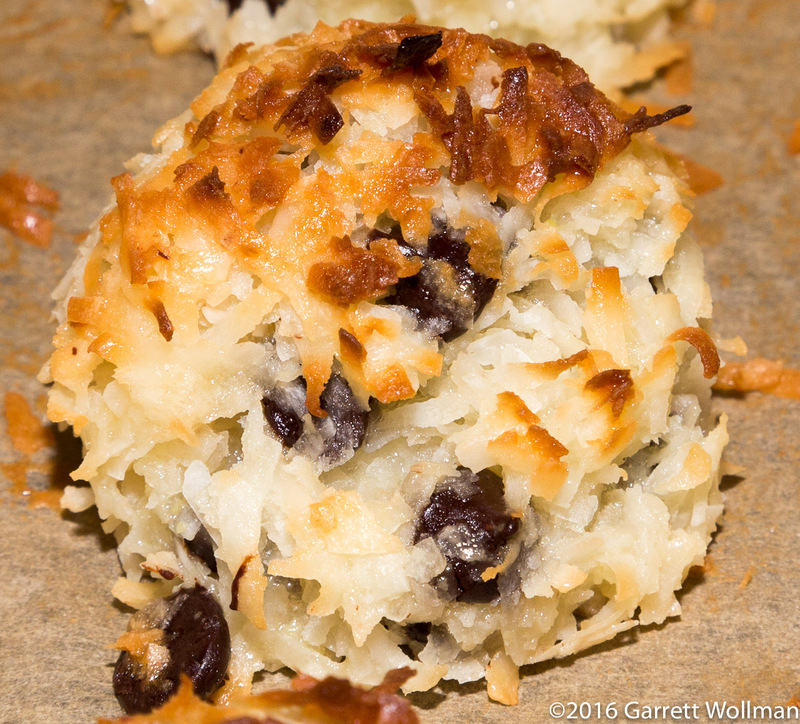 This entry was posted in Food and tagged coconut, Joanne Chang, recipe. Bookmark the permalink.